ST. GEORGE – No. 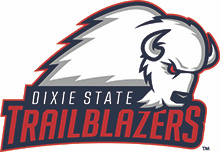 19 Dixie State softball was selected to its West Region-best 10th consecutive Division II West Regional on Monday, as the field of 64 teams was revealed on the Softball Selection Show. The Trailblazers (38-8, 22-8 PacWest) were placed in the West 2 Regional bracket as the No. 3 seed and will take the West Region’s longest active regional appearance streak into the tournament. DSU will battle No. 6 seed Cal State San Bernardino (30-20, 18-16 CCAA) on Thursday at 11 a.m. Pacific Time (Noon MT) in Irvine, California. No. 2 seed and Pacific West Conference champion Concordia-Irvine (44-12, 26-6 PacWest) will host the West 2 Regional, matching up with No. 7 seed Academy of Art (39-16, 22-10 PacWest) on Thursday. Included below is the full release from the NCAA. Click HERE to watch the archived Selection Show.